F.U.D.G.E. Theatre Presents "As Bees In Honey Drown"
F.U.D.G.E. (Friends United Developing Genuine Entertainment) Theatre Company will present "As Bees In Honey Drown," Douglas Carter Beane’s award-winning comedy about deception, fraud, embezzlement, sexual politics, elusive fame, amoral women, sitting-duck men and revenge, from January 25 - 27 at The Factory Theatre, located at 791 Tremont Street in Boston. The company features Linda Goetz, Ryan MacPherson, Anthony DiBartolomeo, Frank Consolo, Milourdes Augustin and Julia Bailey. Joey DeMita (F.U.D.G.E.’s Founding Artistic Director) will direct this now infamous comedy about a con-woman named Alexa Vere de Vere who preys on the almost-famous, promising to fulfill their wildest dreams of success to be played out on the world’s media-lit stage. The seductive Alexa leaves her victims in the dust, holding their maxed-out credit cards in disbelief as they stand in line at their local banks trying desperately to convince the branch managers that their accounts couldn’t possibly be empty. This time around, her “mark” is first-time author Evan Wyler who used to be called Eric Wollenstein. She hunts him down, dazzles him, strips him financially bare and pretty much leaves him for dead. However, he’s very much alive with his sights set on revenge. 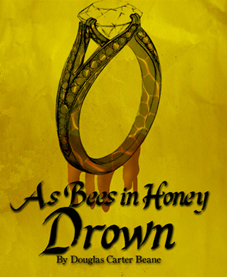 "As Bees In Honey Drown" originally opened to acclaim Off-Off Broadway in 1997. The show made its Off-Broadway premiere seven weeks later at the Lucille Lortel Theatre where it ran for 366 performances. For his efforts, Douglas Carter Beane was awarded the Outer Critics Circle’s prestigious John Gassner Playwriting Award. For tickets and information, call 617-945-0773 or visit www.fudgetheatre.com.